An Education, Health and Care (EHC) plan is the result of an assessment of a child or young person with special educational needs and sets out the education, health and care services that the child or young person should receive. The EHC plan replaced the Statement of SEN in September 2014. Students currently possessing a Statement will be transferred to an EHC plan. 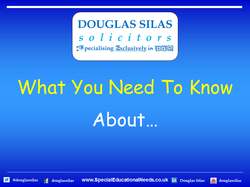 The legal test for a special educational needs assessment remains the same as that under the Education Act 1996. In order to get an EHC plan for a child, the Local Authority (LA) must first conduct an EHC needs assessment. An EHC needs assessment is a multidisciplinary investigation to try to discover what the child or young person’s special educational and associated health and social care needs are, as well as what provisions need to be made to address those needs. The LA should seek input from the child or young person and parents. The LA will also give regard to the child or young person’s position and aspirations as well as the support they need to achieve them. The LA will also seek advice from relevant professionals in the education, health and social care sectors. An EHC assessment does not always result in an EHC plan being issued, and where the LA decides not to issue one, they must provide reasons for the decision. An EHC plan sets out a child or young person’s special educational needs and any health and social care needs. Parents will be sent a draft EHC plan and will be provided with at least 15 days to review and make comments on it before it is finalised. Parents or young people will also have the option to express a preference for the school they would like their child/themselves to go to. The whole process, from the point an assessment is requested, to the issue of a finalised plan, must be completed within 20 weeks. A local authority has six weeks in which to respond to a request for an EHC assessment with a decision. If the LA carries out an assessment but decides that an EHC plan is not needed, then the LA must notify the parents/young person of the decision within 16 weeks from the request for assessment. If the LA decides not to conduct an EHC needs assessment, issue an EHC plan, or if a parent or young person is unhappy with the contents of Section B, F, and/or I of the EHC plan, then they will have a right to appeal to the First-tier Tribunal (Health, Education and Social Care Chamber). Where parents or the young person do not think that the provisions set out are meeting the needs of the child or young person, they can request a re-assessment of their EHC plan. If this is declined, they can also appeal to the First-tier Tribunal. Parents will have two months from the decision date to lodge an appeal with the First-tier Tribunal regarding any of the above matters.